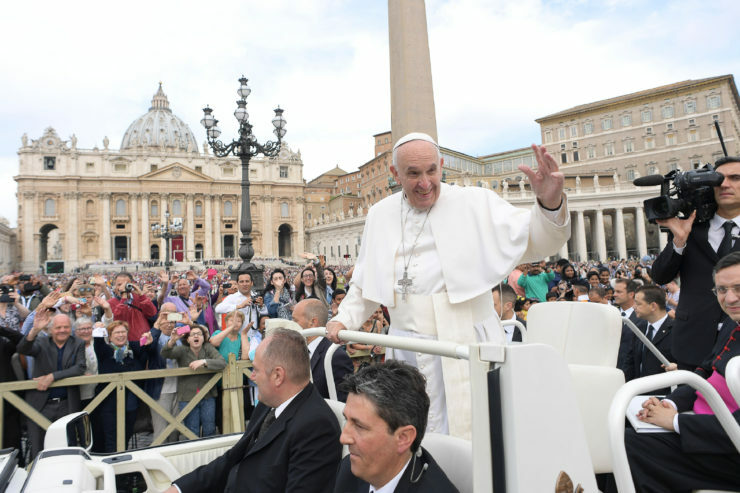 Here is a ZENIT working translation of Pope Francis’ prepared address during this morning’s General Audience in St. Peter’s Square. We dedicate today’s catechesis to a work of mercy that we all know very well, but that perhaps we do not put into practice as we should: to endure patiently people who annoy us. We are all very good in identifying a presence that can annoy us: it happens when we meet someone on the street, or when we receive a phone call … We immediately think: “How long will I have to hear the complaints, the gossip, the requests or the boasts of this person?” It also happens some times that annoying persons are those closest to us: among relatives there is always one; they are not lacking in the workplace and not even in free time are we exempted. What should we do with annoying persons? But we also many times are annoying to others. Why has this also been inserted among the works of mercy? To endure patiently people who annoy us? In the Bible, we see that God Himself must exercise mercy to endure the complaints of His people. For instance, in the Book of Exodus the people are truly unbearable: first they weep because they are slaves in Egypt, and God delivers them; then, in the desert, they complain because there is nothing to eat (cf. 16:3), and God sends quails and manna (cf. 16:13-16), yet despite this, the complaints do not cease. Moses was the mediator between God and the people, and sometimes the Lord also annoyed him. However, God had patience and thus He also taught Moses and the people this essential dimension of faith. Then a first question comes spontaneously: do we ever make an examination of conscience to see if we also, sometimes, are annoying to others? It is easy to point the finger at the defects and lacks of others, but we should learn to put ourselves in others’ shoes. Jesus takes that situation also as a starting point to give a fundamental teaching: His is not a kingdom of power and glory as the earthly ones, but of service and donation to others. Jesus teaches to go always to the essential and to look beyond to assume one’s mission with responsibility. We can see here the recalling to two other works of spiritual mercy: to admonish sinners and to teach the ignorant. We think of the great commitment we can give when we help people to grow in faith and in life. I am thinking, for instance, of catechists – among whom there are so many mothers and so many women religious – who dedicate time to teach youngsters the basic elements of the faith. How much effort, especially when youngsters prefer to play rather than to listen to the catechism! It is good and important to accompany <individuals> in the search for the essential, because it makes us share the joy of relishing the meaning of life. It often happens that we meet persons who stop at superficial, ephemeral and trivial things, sometimes because they have not met someone who would stimulate them to seek something else, to appreciate the true treasures. To teach to look at the essential is a determinant help, especially in a time like ours, which seems to have lost the way and chases short-term satisfactions. To teach to discover what the Lord wants from us, and how we can correspond to Him, means to set out on the way to grow in one’s vocation, the way of true joy. Thus were Jesus’ words to the mother of James and John, and then to the whole group of the disciples, indicating the way to avoid falling into envy, ambition and adulation, temptations that are always lurking also among us Christians. The need to counsel, admonish and teach must not make us feel superior to others, but obliges us first of all to enter within ourselves to verify if we are coherent with all that we ask of others. Let us not forget Jesus’ words: “Why do you notice the splinter in your brother’s eye, but do not perceive the wooden beam in your own? (Luke 6:41).” May the Holy Spirit help us to be patient in enduring and humble and simple in counseling. A warm welcome goes to the Italian-speaking pilgrims. I greet the Masters of Work Federation, which is observing the sixtieth anniversary of its foundation and I hope that the occasion will contribute to foster social and economic inclusion, especially of the weakest sectors of the population. I greet the Sons of God Community of Florence; the Red Cross of Spoltore; the “Christmas Oranges” Association of Camisano Vicentino; the parish groups and the students. In the imminence of the end of the Extraordinary Jubilee may each one remember how important it is to be merciful as the Father and may love for brothers make us more human and more Christian. A special greeting goes to young people, the sick and newlyweds. In the month of November, the liturgy invites us to pray for the deceased. Let us not forget how much they loved us; they have preceded us in faith, as well as those that no one remembers: the suffrage in the Eucharistic Celebration is the best spiritual help that we can offer their souls. We remember with particular affection the victims of the recent earthquake in Central Italy: we pray for them and for their relatives and we continue to be solidaristic with all those who have suffered damages. This coming Sunday, November 20th, the International Day of the Rights of Childhood and Adolescence will be observed. I appeal to the conscience of all, institutions and families, may children and their wellbeing always be protected, so that they never fall into forms of slavery, are recruited into armed groups and mistreated. I hope that the International Community will watch over their life, guaranteeing to every boy and girl the right to school and to education, so that their growth is serene and they look at the future with confidence.